Vøringfossen is Norway’s most famous waterfall, cascading down 180 meters (600 feet) in a series of drops, though it ranks only 83rd on the list of Norway’s highest waterfalls. Vøringfossen is located at Mabodelen, a narrow valley between Oslo and Bergen. Tourists have been visiting Vøringfossen for almost 200 years; a hotel built in 1880 at the top required guests to walk up 1,500 steps to reach their accommodations. The top is easier to reach these days, but the falls aren’t as powerful as they once were because of a hydroelectric plant built upstream. While William the Conqueror was busy invading Great Britain in 1066, the Vikings were occupied with building Nidaros Cathedral in Trondheim. 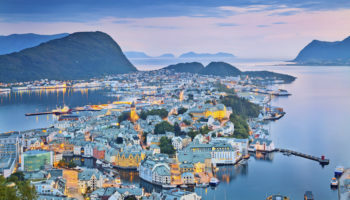 Nearly 1,000 years later, the cathedral is Norway’s most important church and Scandinavia’s largest medieval building. The cathedral was built to honor Olav, a Viking chieftain who later became a king and a saint. Olav was killed in a battle near Trondheim in 1030; his nephew began constructing the Nidaros Cathedral in 1066 to house his body; it was basically finished in 1090, though enlargements continued until the 1300s. The cathedral soon became an important pilgrimage destination in Norway. 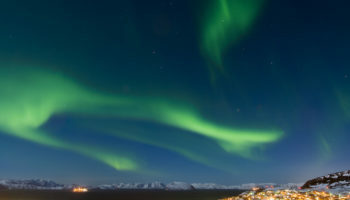 Nordkapp, or North Cape, is a must for travelers who want to frolic under the midnight sun, since the sun never sets between May 14 and July 29. It is the northernmost point in Europe connected with the international road network. 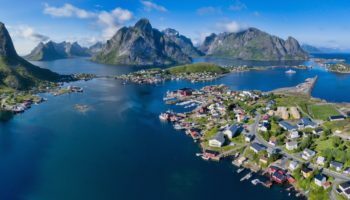 Because it’s in the far north, rising 300 meters (1,000 feet) above the Arctic Ocean, Nordkapp is mainly a summer destination, attracting about 200,000 visitors annually. 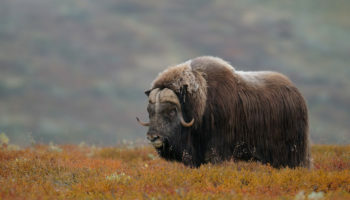 Nordkapp offers stunning scenic views, with plenty of opportunities to hike under the Arctic sun or see puffin in their native habitat. Icy and scenic is perhaps the best way to describe Jostedalsbreen Glacier, the largest glacier in Europe. 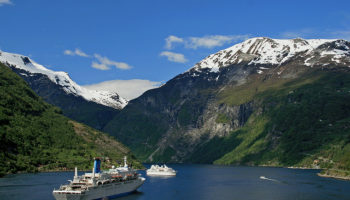 Situated in southern Norway, the glacier is surrounded by Jostedalsbreen Glacier National Park. Many, many years ago, locals could cross the glacier on foot, perhaps herding animals on their way to market, but this isn’t possible today as the glacier has shrunk significantly. Hiking and glacial skiing is allowed, but sportsmen need to be well prepared as these activities can be dangerous. It is much safer, and just as pretty, to take one of the walking tours around the park. 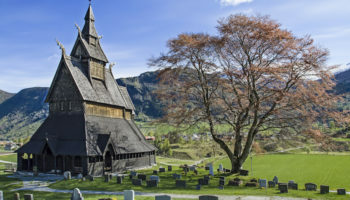 The Heddal Stave Church is Norway’s largest stave church, with triple naves that stand proudly against the sky. The church, made entirely of wood, was built in the 13th century; according to local legend, it was built in three days by five farmers. After restorations in the 19th and 20th centuries, the church is still in use today for weddings and Sunday services during the summer months. Located in Notodden, the church is dedicated to the Virgin Mary. 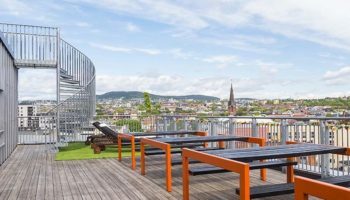 Travelers who get “museumed” out may enjoy a visit to the Bryggen waterfront, an informal museum that doesn’t seem like a museum. 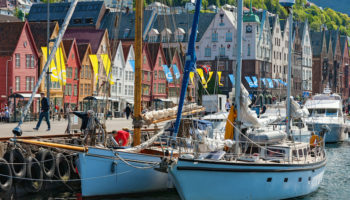 Traditional buildings line the waterfront with boats tied just feet away on Bergen’s seaside. 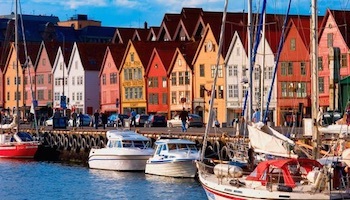 The scene is so picturesque, visitors can easily forget Bryggen is linked to Bergen’s importance as a trading center for 400 years during the Middle Ages, when it was part of the Hanseatic League. Today’s traders can shop in trendy boutiques, visit craftsmen’s studios or enjoy a bite to eat down a narrow alleyway. 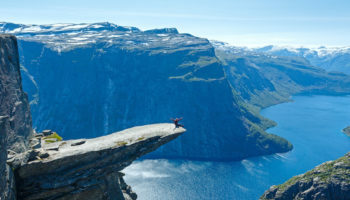 The most famous tourist attractions in Norway are probably it fjords. 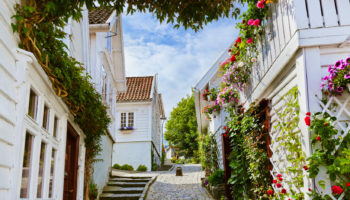 Among the most beautiful of these fjords is Geirangerfjord, located in southwestern Norway near the coastal town of Ålesund. 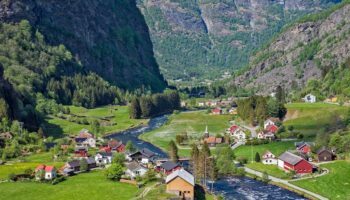 Stretching for more than 15 km (9 miles) long, Geirangerfjord is a natural wonder of deep blue water surrounded by majestic cliffs and lush green mountains towering more than 1,000 meters (3,500 feet) high. Adding to the spectacular scenery are several stunning waterfalls and lush countryside dotted with picturesque farms. Amazing scenic tourist destinations. Thanks for posting.